The launch of the Ariane 5 rocket with GSAT-18 and Sky Muster II communications satellites has been delayed due to unfavorable weather conditions, according to a statement made by Arianespace. 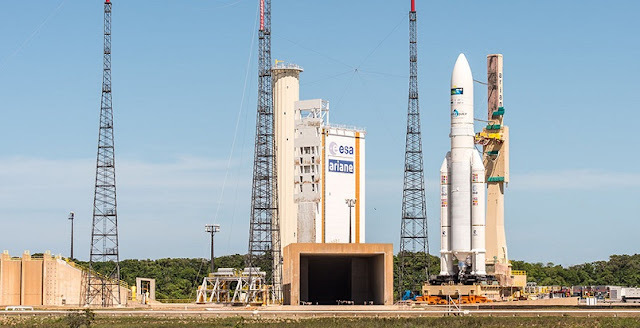 The mission, designated VA231, was expected to liftoff at 5:30 p.m. local time (4:30 p.m. EDT; 20:30 GMT) on Tuesday, Oct. 4, from the Ariane Launch Complex № 3 (ELA-3) in Kourou, French Guiana. The start of the mission was delayed by one day – hence the new 1-hour, 15-minute launch window opens at 5:30 p.m. local time (4:30 p.m. EDT; 20:30 GMT) on Wednesday, Oct. 5. “Unfavorable weather conditions over the Spaceport in French Guiana have resulted in a 24-hour delay for Arianespace’s Ariane 5 mission with the Sky Muster II and GSAT-18 payloads,” the company said in a press release. Arianespace added that the Ariane 5 rocket, as well as its payload, is currently being maintained in safe standby conditions at the Kourou spaceport. The company’s CEO, Stéphane Israël, revealed that the postponement was caused, in particular, by high-altitude winds. He also noted that Wednesday’s weather conditions for the launch are favorable and should enable a flawless liftoff. The VA231 mission will deliver GSAT-18 and Sky Muster II (also known as NBN-Co 1B) commsats into a geostationary orbit. The flight will last one hour and 22 minutes, with the Sky Munster II being released at 28-and-a-half minutes after launch and GSAT-18 being deployed some four minutes later. GSAT-18 is India’s latest communications satellite. It was built by the Indian Space Research Organization (ISRO) and will be operated by the Indian National Satellite System (INSAT). Sky Muster II is an Australian commsat that will be operated by NBN Co Limited – a government-owned corporation that manages the country’s National Broadband Network (NBN). The spacecraft is expected to extend high-speed internet to Australia, including the Norfolk, Christmas, Macquarie, and Cocos islands.